Liverpool are seemingly in no mood to waste time as they seek to strengthen in preparation for a 2018/2019 Premier League title charge. The Reds are braced for a busy summer transfer window as Jurgen Klopp looks to rectify the lack of strength in depth that extracted a monumental effort from his players over the final stages of the season. Introducing attacking reinforcements is one priority in aid of filling the void left by Philippe Coutinho and offering the Reds’ dynamic front three some welcomed assistance. Lyon’s Nabil Fekir is the man to have ascended to the top of that position-specific wish-list courtesy of his instrumental role in captaining his side to Champions League qualification in Ligue 1. Liverpool look set to fulfil expectations from the British media of an intensified pursuit for the Frenchman after the Champions League final, with negotiations expected to begin early this week, according to L’Equipe. 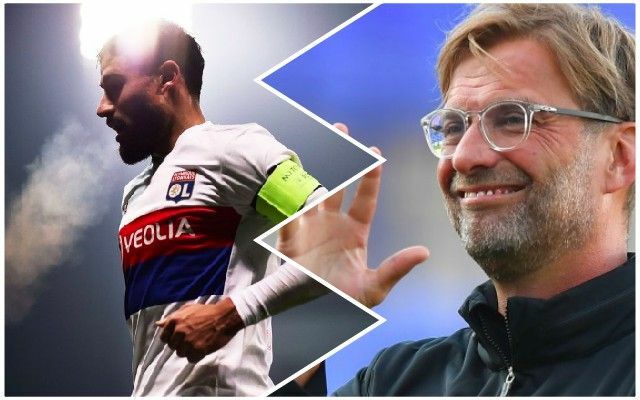 Fekir registered 23 goals and nine assists in 40 appearances across all competitions this season to continue his inspired resurgence following a seven month spell on the sidelines with an anterior cruciate ligament injury in 2015. His evident contributions both behind and on the end of goal-scoring opportunities have seen him surface as a suitable fit to an interchanging Liverpool system in which the likes of Mohamed Salah, Sadio Mane and Roberto Firmino have often shared the workload. Recruiting a new goalkeeper has re-emerged as a priority in light of Loris Karius’ torrid Champions League final, with Liverpool tipped to draw up a fresh move for Roma’s Alisson. Reds can also expect to see the club add a replacement for Juventus-bound Emre Can and potentially another central defender given Joel Matip’s injury woes.